As I've mentioned before, Rose's Luxury, with their Eggplant Tarte Tatin, Smoked Celery Mascarpone, and my favorite-- an English Pea Cake, has really opened my eyes into the exciting possibilities of vegetable-based desserts. While Aaron Silverman and crew certainly give these treats their own creative spin, these are not without their roots in traditional American and British baking. Of course, there's carrot cake and pumpkin pie, but I've also seen less common selections in old cookbooks-- Tomato Soup Cakes, Carrot Pie, Fannie Farmer's Caramel Potato Cake, and this Pretty Black Eyed Pea Cake-- a spice cake variety that's distinctly southern. There isn't much information about the cultural history of such desserts readily available, but it's a genre I'm planning to explore more. This Sweet Pea Cake with Lemon Buttercream is British in tone (and not just because it's adapted from the UK blog Veggie Desserts)-- I imagine it as a perfect al fresco tea time accompaniment. It's a little more classic and oriented for the home baker than Rose's Luxury's pudding-like variety with mint curd and buttermilk cream. 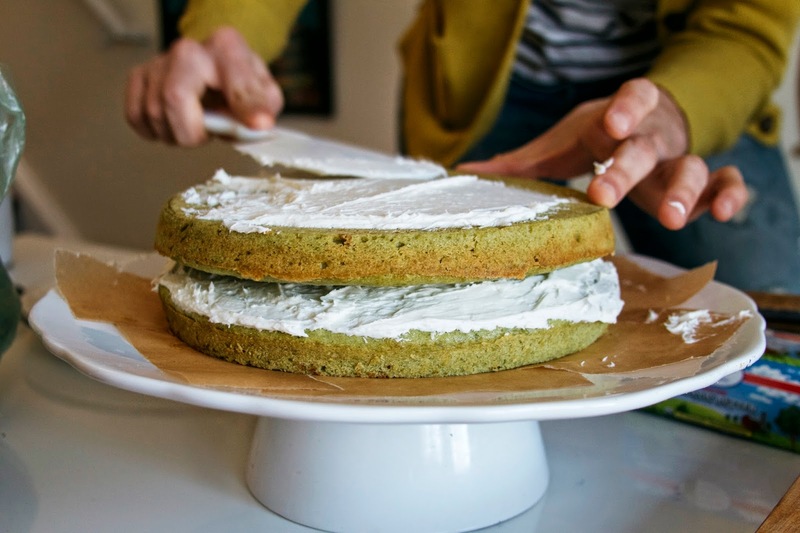 But in both, the pea purée makes the cake dreamily moist with a shocking green hue, while the pea shoots and other fresh greens position it squarely in the season of SPRING, no matter when you're actually eating it. I baked this for a little luncheon with Morgan (of Panda Head Blog) and illustrator Elizabeth Graeber. 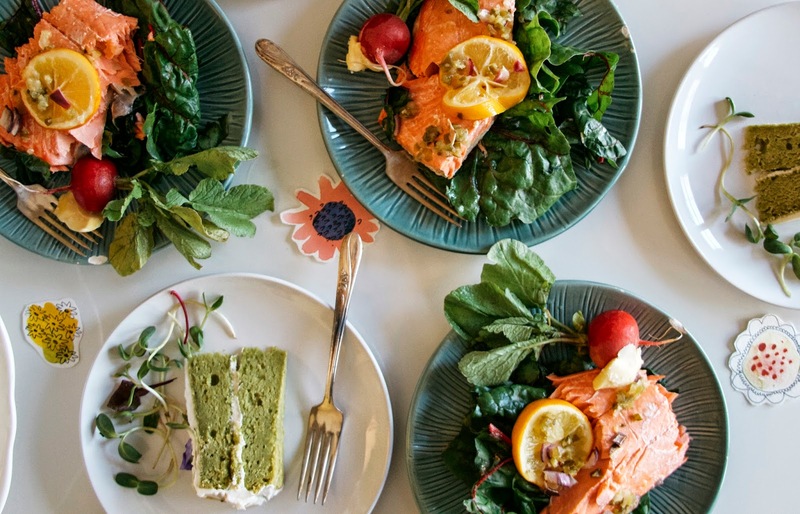 Elizabeth and I both have birthdays in April, so we were doing double duty--picking up our collaboration series again as well as celebrating with a colorful spring meal. 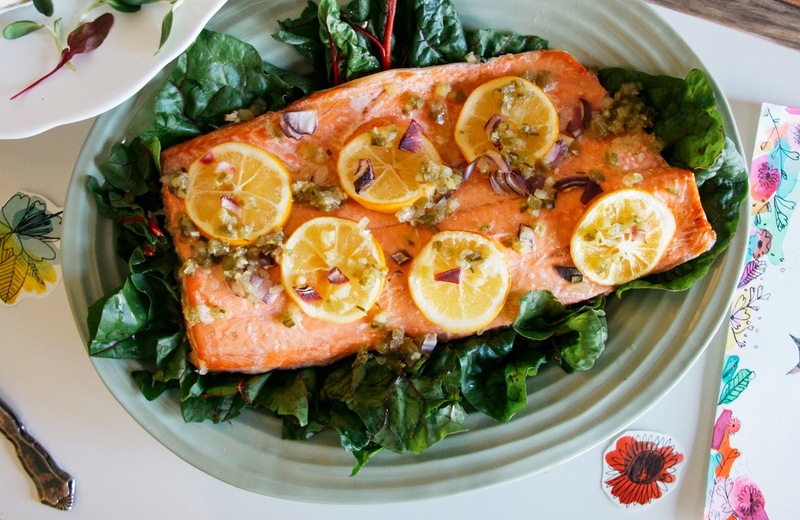 Morgan made the zingiest Salmon with Lemon over Greens for our main course, and fresh radishes with butter and salt held us over while we snapped the obligatory photos and iced the cake. Big thanks to the P St. Whole Foods for offering up most of these ingredients. 1. Preheat the oven to 325 degrees F. Grease and line two 9” cake pans (or three 6” pans) with parchment paper. In a medium saucepan with just enough water to cover the peas, bring peas to a boil for 3 minutes, then drain and refresh under cold water. 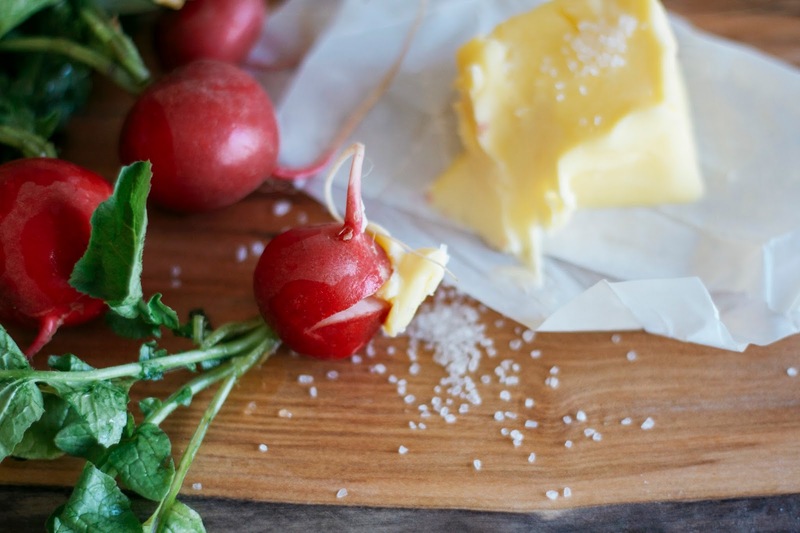 Place peas in the bowl of a food processor and puree until completely smooth. Set aside. 2. In a medium bowl, sift together flour, baking powder, and salt, whisking gently to combine. Set aside. 3. In the bowl of a standing mixer fitted with the paddle attachment, cream together the butter and sugar until light and fluffy. Beat in the eggs, one at a time, then beat in the cooled pea puree, vanilla, and lemon zest and juice. On low-medium speed, add the flour mixture just until incorporated. 4. Spoon the mixture into the prepared cake pans, spreading batter evenly and leveling. Bake for 25 minutes or until a skewer inserted in the middle comes out clean. Cool for 10 minutes in the pans, then turn onto a wire rack to cool completely before icing. 1. In the bowl of a standing mixer fitted with the whisk attachment, cream the butter until fluffy. Add in the confectioner's sugar and beat at least 3 minutes. Beat in the zest and a little of the lemon juice. Add more lemon juice as needed to make it a spreadable frosting consistency and beat to combine. Store in the fridge until ready to use. 1. Spread the buttercream between the layers of the completely cooled cakes and sandwich together. 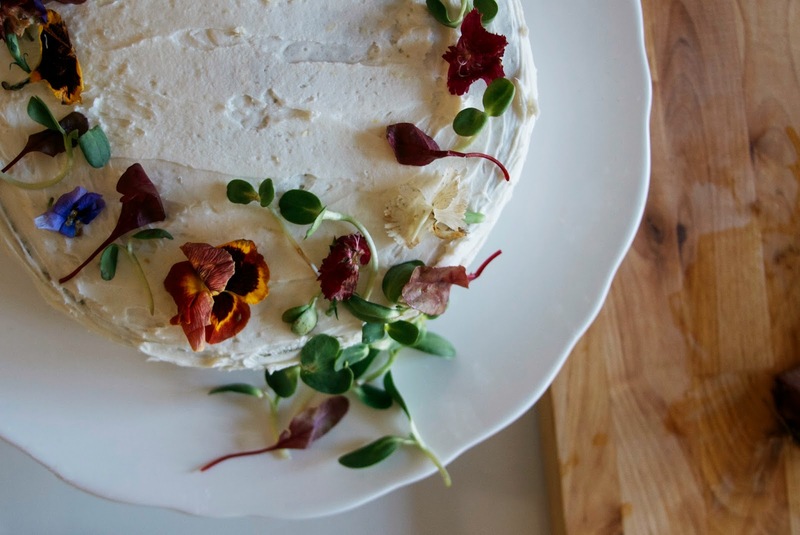 Cover the cake in the remaining buttercream and decorate with pea shoots, microgreens and edible flowers. 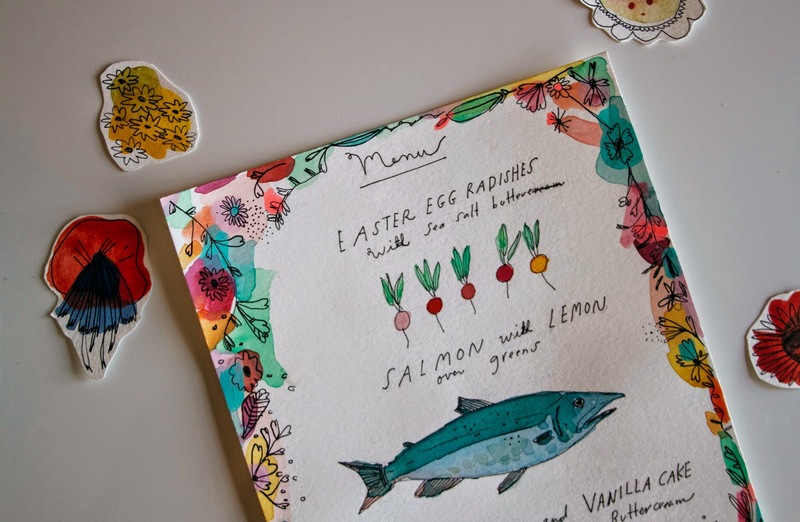 Find Elizabeth's brilliant related illustrations (including the menu) at Food on Paper and visit Panda Head Blog for more of Morgan's photos and the recipe for Salmon with Lemon over Swiss Chard. Labels: birthday cake, cake, elizabeth graeber, Panda Head, sweet pea cake with lemon buttercream, Washington D.C.
Beautiful cake! I loved the pea dessert at Rose's. 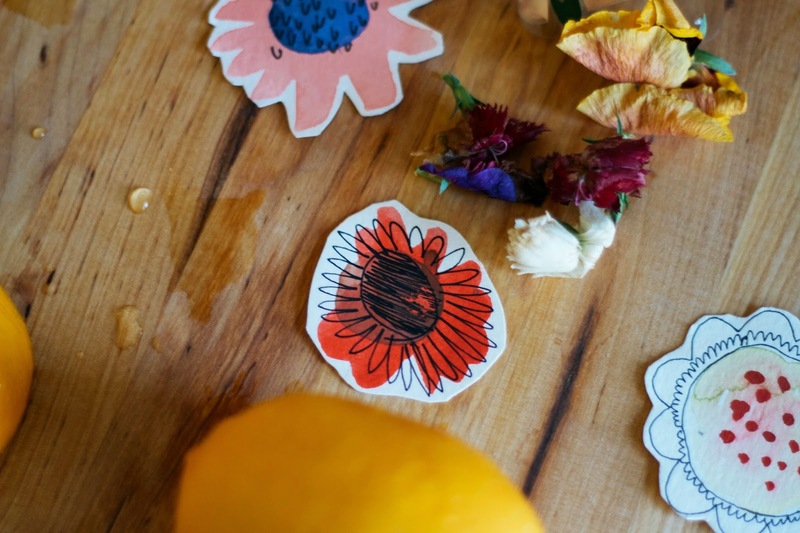 Did you get those edible flowers from Whole Foods as well?